The Cicada is quite a large and bulky insect. 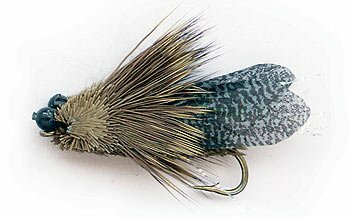 The cicada pattern is a popular surface fly to use when this insect is chirping in high summer. I have been at Lake Selfe, in the Canterbury high country, when hundreds of them have been making a deafening racket. They all seem to sing at once and prefer to hang out in the same tree. The sound is a loud chirping, with a click noise at the end caused by a flick of the insect’s wings. Only the males make this noise. Deer Hair Cicada with artificial wings. Tied from deer hair on a size 4-8 hook the cicada is an easy fly to tie. 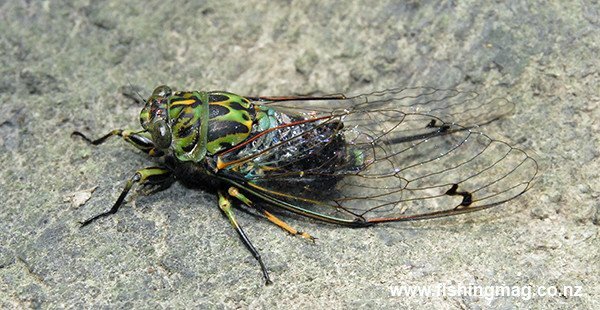 Nowadays many anglers employ modern materials when tying cicada patterns. You can guarantee your fly will float by making the body from closed cell foam. Plastic wing material, sold in tackle stores for the purpose, gives the finished fly a very life-like appearance. 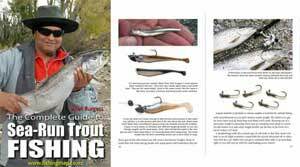 Left floating on the surface ambush style a few gentle twitches are all that is required to have your fly “buzzing” with movement irresistible to any cruising brownie. Deer hair has long been the material of choice for tying cicada patterns.